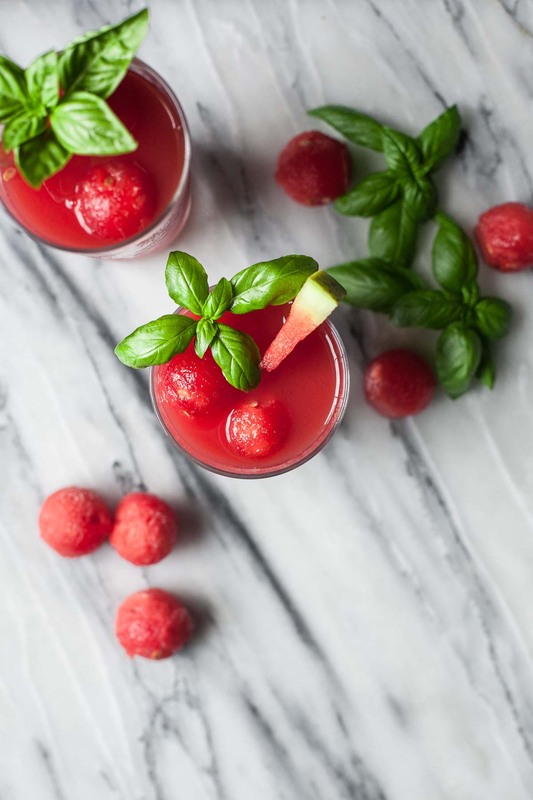 This refreshing watermelon cooler has a hint of basil and cucumber and stays chilled thanks to frozen watermelon balls. Cheers to summer! Big news: the popsicle stain came out of my pants, and I made us a watermelon cooler to celebrate! A couple weeks ago Ben came home with a really pretty bottle of something called Uncle Val’s Botanical Gin. He tried it at a bar in Nashville and enjoyed it, so he hunted down some to bring home. I was excited because gin and tequila are my spirits of choice, but Ben usually only buys whiskey and I just can’t stand it. I tried the gin and in addition to the expected piney juniper flavors, I noticed hints of cucumber and sage. It’s such a unique flavor, and really refreshing for summer. I suspected it would pair perfectly with fresh watermelon and decided to create this watermelon cooler. 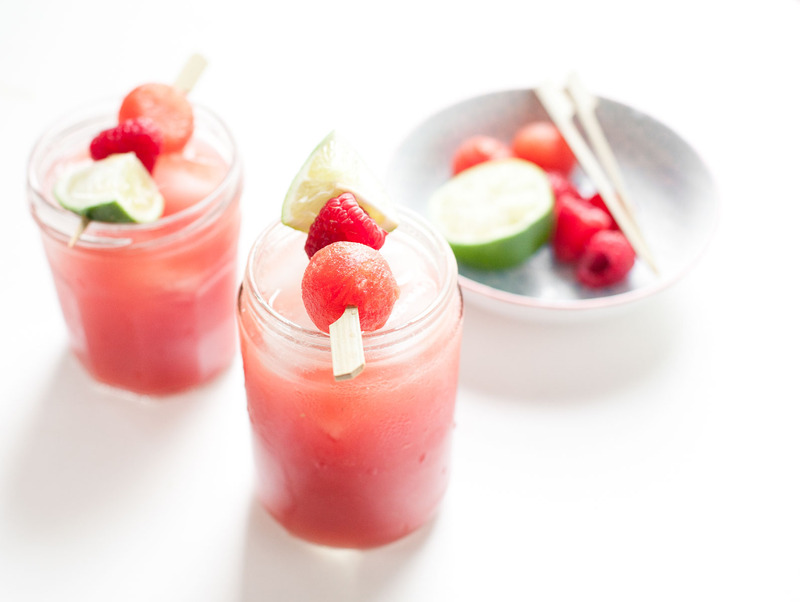 A watermelon cooler is just what you need on a summer Friday. If gin is not your spirit of choice, this is also delicious virgin and I bet it’d be great with tequila, too. It’s basically watermelon juice amped up with a bit of subtlely herbal honey syrup and tangy lime juice. I “graduated” from my master’s program on Monday. We all walked across the stage, shook the provost’s hand, and got our picture taken with a little rolled up “diploma” that, when opened, basically congratulated us on having ALMOST finished our degrees. Even though the speech-language pathology program goes through August, my school only has one graduation ceremony a year, which means we all walk before taking our comprehensive exams and before our final semester has even begun. Although it was, as my classmates are calling it, a “frauduation”, I deemed it cause for an actual celebration. And what better way to celebrate than with a refreshing drink? 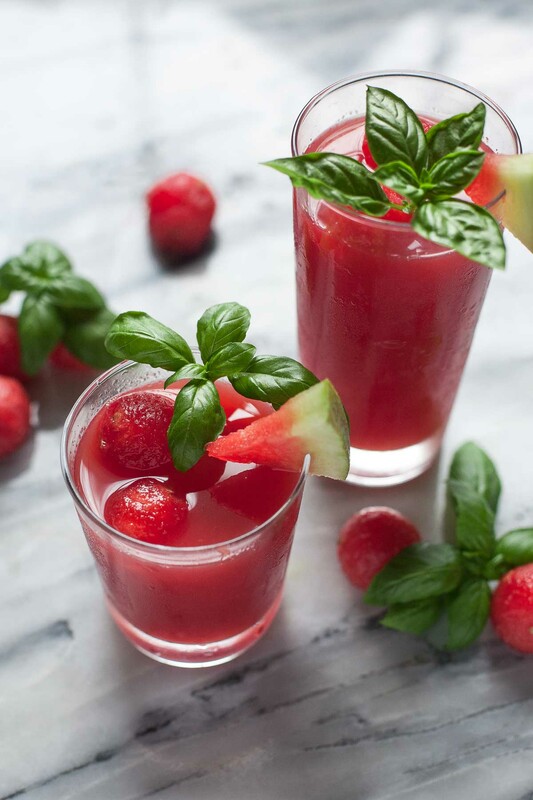 This agua fresca is so easy to make, but its unique color and flavor make it feel special. 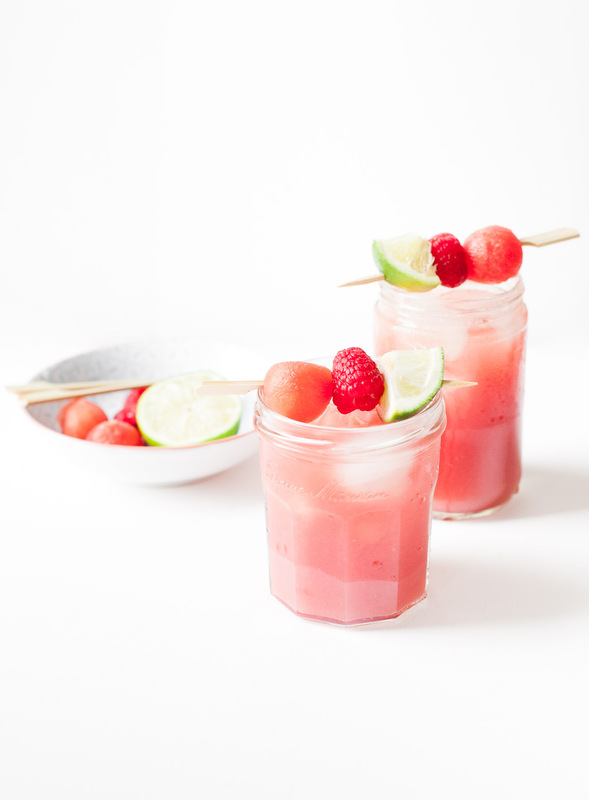 Agua fresca is often made with just watermelon, but I added raspberries here, too, to amp up the flavor and deepen the hue. The cool, sweet watermelon and tart raspberries make a great pair.